Middle School art teacher Nathan Pankratz recently opened his second show at the Bridgette Mayer Gallery: “So many ways to say I love you, I think I’ll try every one.” A painter and color enthusiast fueled by the process of creating, Mr. Pankratz gives us a glimpse of his work. As a child, I was very good at drawing. I really liked slowing down, observing things, and trying to record them accurately. I sat in on a couple of painting courses in college and loved how seriously and poetically the students discussed art. I switched my major from architecture to fine arts and graduated with a dual BFA/BS in education. My father is an engineer and is very creative in terms of solving problems; his influence shaped the way I approach my art. I find the process of creating – with interesting tools like power saws and grinders – very fulfilling. My great grandfather was a master plasterer, so I suppose to some extent perfecting a craft and a process is in my blood. My interest in architecture was piqued in high school when I worked for a construction company. I was always fascinated by how things were made. Tell us more about the process of creating. The surfaces of my paintings are quite smooth; that process takes a long time to refine. The canvas becomes almost like ivory, so when you apply paint, it does something different than a traditional surface might. The color is able to be pulled and dragged a little bit longer and doesn’t give up quite as easily. To see the paint behave differently than expected, almost as print or photography, is very exciting to me. I think my target audience is my father, who doesn't have a propensity toward appreciating art, but really likes how stuff is made and how problems are solved. My work may have a minimalist bend to it, and could certainly be characterized as abstract. The biggest criticism of this type of work is “it’s easy, my kid could do that,” so I’ve always tried to produce something that at first looks somewhat recognizable, but then invites the viewer to see that there’s an impossibility to some of these things: how is the paint lying on the surface? How are the layers formed? In GrInd 01, I worked with two assistants to braid paint in real time. The painting looks simple when you see it, but then you consider the complexity of creating that braided line without actually lifting the brush from the canvas. Many of my works are not illusions to layers, but are literally layers. I like that play of looking simple but being a technical dance; a very choreographed act. What are you currently exhibiting at the Bridgette Mayer Gallery? The name of the show is “So many ways to say I love you, I think I’ll try every one.” That’s a nod to some of the various modes of production, but also to the way we understand color. You can approach color from a scientific understanding: we know that we see yellow when there is yellow light, and also when red and green light intersect, but the wavelengths of those two yellows are not identical. Also, if we stare at violet for a long time, when we look away the reverse of that is seen, so we’re seeing yellow almost as a negative. Because we don’t fully understand color, it allows room for poetry and imagination. There’s an economic and historical context to color, too. At one point, blue cost more per ounce than gold. When you see the Virgin Mary wrapped in a blue or violet robe, there’s not only a cultural significance to that, but also an economic one. Blue is actually a fairly newly defined color; it isn’t easily found in nature and so wasn’t part of our early vocabulary. If you look at some of Homer’s early writings, he uses very descriptive language and talks about the hues of objects but never mentions the color blue; he wrote about the sea as being the color of wine. Another interesting discovery made by Winsor & Newton is the violent history of gamboge yellow. The color, used to dye Buddhist monks’ robes, is harvested from the resin of certain evergreen trees. Decades ago, Winsor & Newton found resin samples with bullets lodged in them, traced back to the killing fields of Cambodia. Every color has a story to tell. How does your studio work and classroom work intersect? My studio work feeds what I do at Haverford and vice versa. The way in which we have shaped the art studio curriculum informed my statement, the way I approach my paintings, and the way I think about them. Creativity is a process that can be refined overtime with an intelligent approach; I’ve developed an approach that very much models what we teach here at Haverford. Art department chair Chris Fox’s creative process model starts with a problem or challenge, leads us through experimentation and exploration, then refinement, toward prototyping and organizing, and finally to a solution. I tend to photograph a lot of my work and do my planning, prototyping, and risk-taking digitally before getting into the studio. The way in which we have shaped the art studio curriculum informed my statement, the way I approach my paintings, and the way I think about them. Creativity is a process that can be refined overtime with an intelligent approach; I’ve developed an approach that very much models what we teach here at Haverford. How does your work as an artist influence your work as a teacher? The students are smart. They want to see lessons in action. When I can illustrate how I used the creative process to achieve an end result, the kids are inspired. All of the faculty at Haverford do something; they’re not just academics, they’re writers, they’re scientists … it’s really fun to work alongside professionals who are living and seeing out some of these processes that they’re teaching in their classes. “So many ways to say I love you, I think I’ll try every one” runs through Dec. 23 at the Bridgette Mayer Gallery. 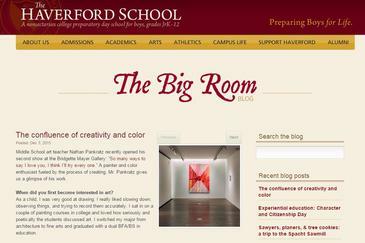 Nathan Pankratz teaches Middle School art at The Haverford School. He earned a BFA from Penn State and an MFA from the University of the Arts. Pankratz received the Henkels Award from the University of the Arts in 2008 and has exhibited widely, including several international shows along with previous solo exhibitions at the Bridgette Mayer Gallery, Patterson Gallery, and Gallery @ 543.